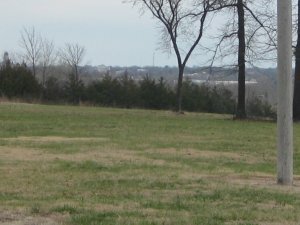 Directions: The Ordnuff Hill tour stop [ Waypoint = N37 11.693 W94 19.615 ] is located north of Carthage, Missouri 64836 on Civil War Avenue. It is about 2.8 miles from the previous tour stop. You will cross Locust Road. You will cross Kafir Road. You will drive under US 71 highway. 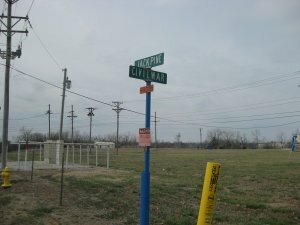 About 0.6 miles past US 71 on Civil War Avenue, you will come to Jack Pine Road (please note that Google Maps thinks Jack Pine is named Ivy Lane here). Find a place to park. Be careful for this is a fairly busy industrial park with large trucks. Description: This stop on the tour places you on top of Ordnuff Hill (called Quarry Hill today) where Sigel posted a defensive line to protect his crossing the Spring River. 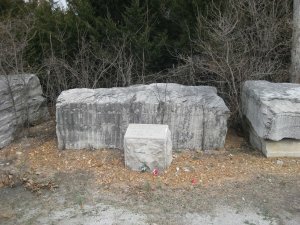 Get out of your car and walk to the third Granite Historical Marker. 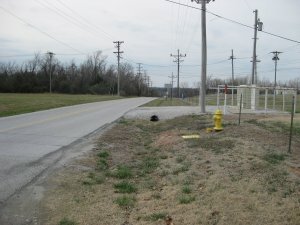 It is located on the northeast corner of the intersection of Civil War Avenue and North Woods. 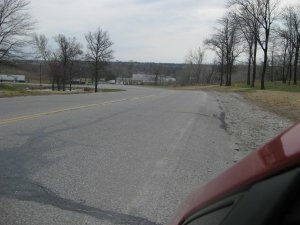 You are now standing approximately where Sigel established a defensive line to protect his crossing of the Spring River as he continued his retreat to Carthage. The troops and baggage train crossed [Buck's Branch] creek, and retreated unmolested to the heights crowning the north side of Carthage before Spring River. Here they took position again. The enemy advanced slowly with his center, while he pushed forward his cavalry to turn our right and left, and to gain the Springfield road. 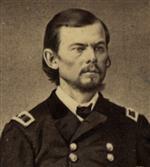 Colonel Sigel again commenced a retrograde movement, and retreated across a prairie 5 miles to Spring River, closely followed by the infantry and artillery. The cavalry under my command, joined by a regiment of General Slack's division, commanded by Colonel Rives, endeavored to outflank them on the right, but the retreat was so rapid as to defeat our object. On nearing Spring River we attempted to intercept the enemy's crossing, but they again opened a heavy and destructive fire from their artillery, which compelled us to take a crossing higher up, and, pushing forward, endeavored to surround the town.